Thirty years ago I came over the Cambrian mountains. I am still learning about this place. 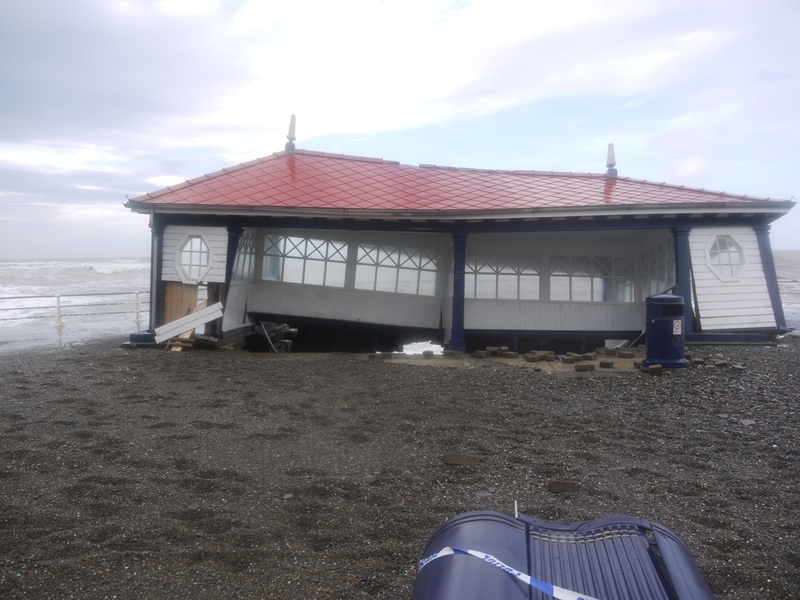 Back in its rightful place, after the terrible drubbing during the storm of 3-6 January, is the neo-Georgian shelter on the Aberystwyth Promenade. It was publicly reopened last Saturday with the mayor, the Chairman of the County Council, the MP and other dignitaries in attendance. It is salutory to remember that the Cadw listing recently bestowed on the building probably saved its life. 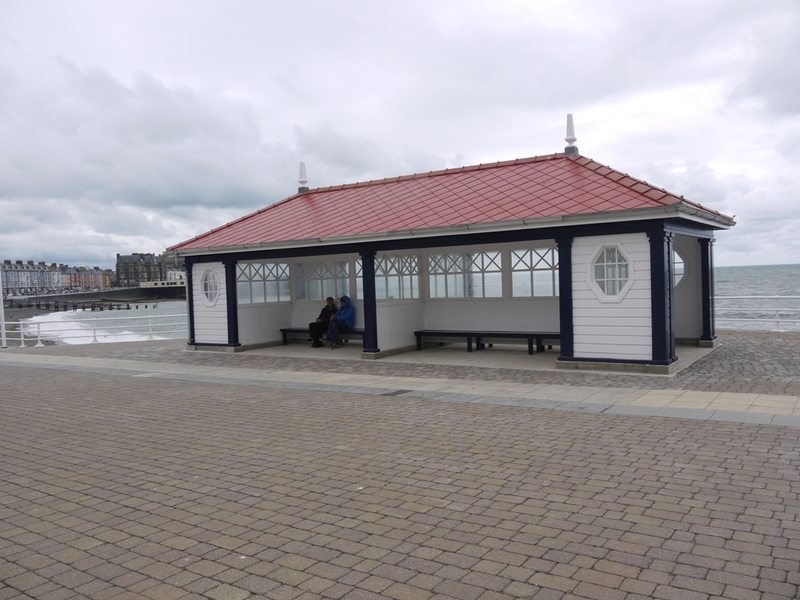 There were until three years ago two such shelters on the promenade, the smaller of which was demolished and removed in January 2011. The surviving Bathrock Shelter was listed Grade II shortly afterwards. The name of the shelter ‘Bathrock’ alludes to a former building in this position: Dr Rice William’s Marine Baths which were built in 1810. 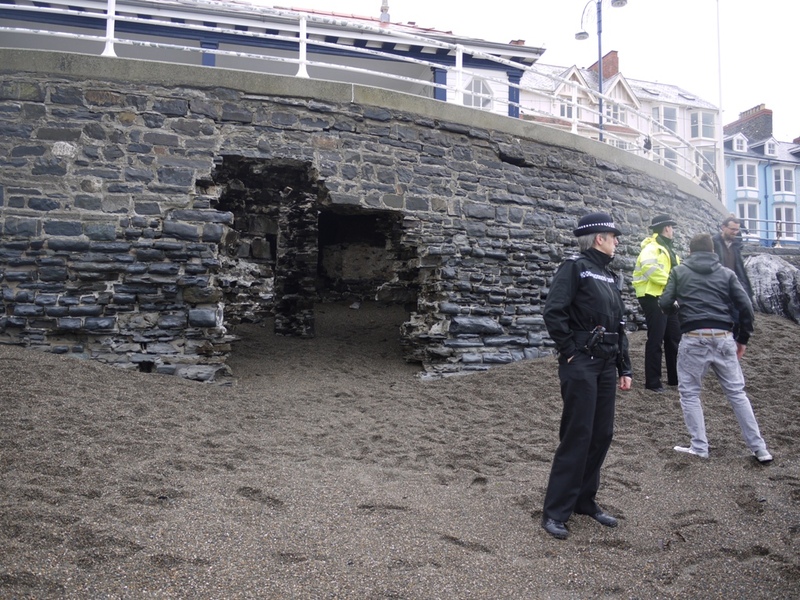 At the time they were the most northerly feature on the sea front, a two storey building providing Aberystwyth’s visitors with the curative benefits of sea water served in a variety of ways in a situation of complete privacy. Each private room provided a bath ‘six feet long and two and a half wide, lined with Dutch tile, which being much less porous than marble, is more effectually cleansed from all impurities to which they are liable’. Baths could be taken cold or hot, and in the form of a plunge bath, a vapour bath or a shower. Boilers heated the water, and the visitors could be further assured that the water was drawn along cast iron pipes reaching far out into the bay. The spectre of inshore pollution from other bathers, or the donkeys pulling bathing huts, could thereby be avoided. The baths eventually closed in 1892. Bathing was still in vogue but by this time for those requiring an indoor experience, there was a new bath house on Bath Street, which instead boasted the Chalybeate waters of a nearby spring, while at the Queen’s Hotel on the promenade the guests enjoyed taps dispensing, hot water, cold water and sea water into their baths. The promenade was being extended in a northerly direction, and the remains of the old marine baths were incorporated into it, roughly filled, it seems, with rubble from the demolition. In 1924 a new shelter, glazed down its spine and providing seating facing in each direction, was erected on the curved prominence above bath rocks. 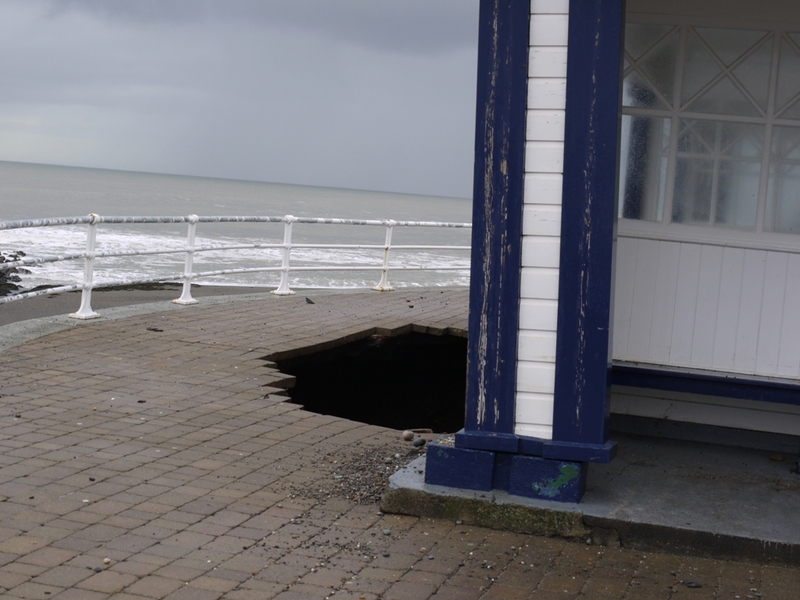 The remains of the old bath house was unexpectedly revealed to view when the winter storm tore away the stone facing of the promenade. The sea soon excavated a hole through which the rubble fill was sucked away exposing a sea cave beneath the shelter. It was a man-made cave, with walls, partitions and even a fireplace. As the concrete pad on which the shelter stands collapsed into the void, the building flexed, twisted and subsided into the hole. Police stood by to prevent incautious exploration, and in the following weeks the damaged structure was dismantled and stored pending restoration. The partitions of the rooms of the old bathhouse could be clearly seen. 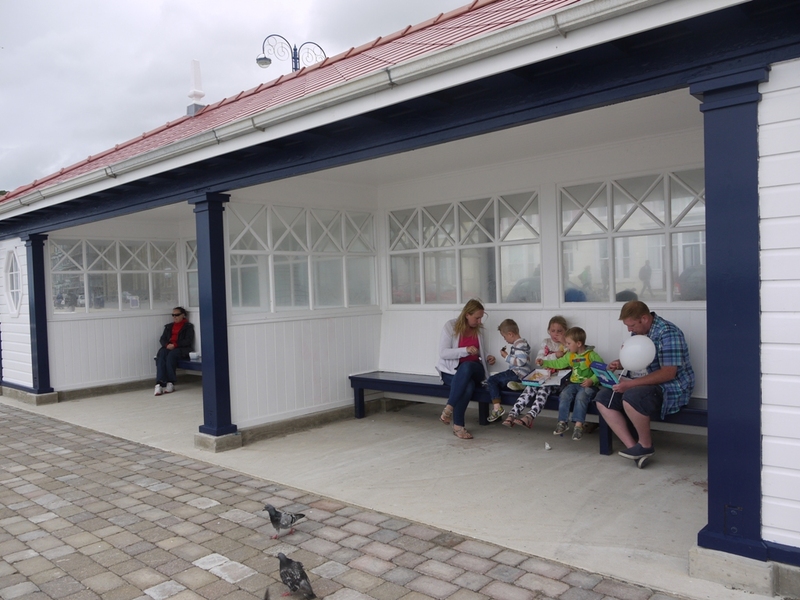 The shelter is the last item in a programme of repair of the promenade which was in the main completed before the season began at Easter. 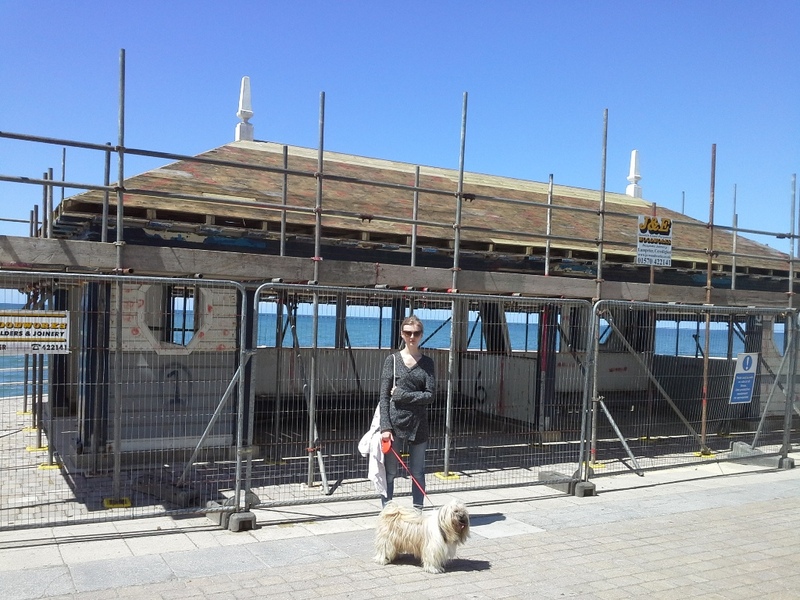 In the blazing days of July, when temperatures often exceeded those in Spain, and the sea temperature reached a balmy 17C the old timbers of the restored and replaced shelter was await their first coat of paint. On 6 July 2014 the shelter was back, but yet to be painted. Now the weather has turned grey and cold, and in the coming winter it will be particularly appreciated as a windbreak on the bracing seafront. This website and its content is copyright of The Curious Scribbler. All rights reserved. Any redistribution or reproduction of part or all of the contents in any form is prohibited other than the following. You may print or download to a local hard disk extracts for your personal and non-commercial use only. You may copy the content to individual third parties for their personal use, but only if you acknowledge the website as the source of the material. You may not, except with express written permission, distribute or commercially exploit the content. Nor may you transmit it or store it in any other website or other form of electronic retrieval system. Every effort has been made to credit the copyright holders of all pictures and images used on this website. If you are the copyright holder of any uncredited image herein, please email me.